Colloidal Organization presents a chemical and physical study on colloidal organization phenomena including equilibrium systems such as colloidal crystallization, drying patterns as an example of a dissipative system and similar sized aggregation. 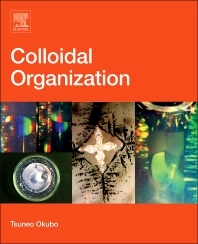 This book outlines the fundamental science behind colloid and surface chemistry and the findings from the author’s own laboratory. The text goes on to discuss in-depth colloidal crystallization, gel crystallization, drying dissipative structures of solutions, suspensions and gels, and similar-sized aggregates from nanosized particles. Special emphasis is given to the important role of electrical double layers in colloidal suspension. Written for students, scientists and researchers both in academia and industry and chemical engineers working in the fields of colloid and surface chemistry, biological chemistry, physical chemistry, physics, chemical technology, and polymer technology this book will help them to exploit recent developments recognizing the potential applications of colloid science in enhancing the efficiency of their processes or the quality and range of their products. 2.14. Why Does Colloidal Organization Take Place? Professor Tsuneo OKUBO was born in Tsubame, Niigata, Japan in 1941, and graduated from the Department of Fiber Chemistry of Kyoto University, Japan in 1961. He studied polymer physics and awarded Master and Doctor of Engineering in 1966 and 1971, respectively at the same university. He joined the Department of Polymer Chemistry as a Research Assistant in 1969 and was appointed Associate Professor in 1978 at the same department. He was a research Associate with Professor N.J. Turro at Columbia University, USA in 1978 and 1979. He was promoted to full Professor at the Department of Applied Chemistry of Gifu University in 1996. He retired from the Gifu University and was appointed Professor Emeritus from the same university in 2004. He founded the Institute for Colloidal Organization at Kyoto in 2004 and the Head Professor of the Institute. He was also appointed Guest Professor of Yamagata University in 2004. He was awarded the Polymer Science Award in 1978. He was the Chair of International Advisory Board of Electro-optics series 2006 to 2010. He is an Editorial Board of the International journal, Colloid Polymer Science in 2008. His research interests include the physical chemistry of polyelectrolyte solutions & colloidal dispersions including microgravity experiments and colloidal organization phenomena including colloidal crystal, drying patterns and similar sized aggregation.